How to Backup iPhone Data: Photos, Videos, Contacts & More? Imagining that your iPhone is stolen or broken accidently but you didn't backup data iPhone XS Max/XS/XR/X/8/7 etc in advance, what can you do to recover the lost files? Apple considered that earlier in 2011 and provided iCloud to suggest you to have an up-to-date backup everyday to get things back if your device gets in trouble. When your data gets lost, you will lose more than a set of data but your memories or connections to the outside to some extent. So, we must urge you to have an iPhone data backup regularly to protect anything precious. Besides, at this very moment of iOS 12 update, iPhone data backup will also assure the safe iPhone data preservation leaving no chance to missing photos or disappearing contacts. How to Backup Data iPhone XS/XR/XS without iTunes & iCloud? The versatile iPhone data backup software, DearMob iPhone Manager, could offer some help no matter you want to fully backup iPhone data files at a stroke with encryption method or selectively backup iPhone photos, music, videos, contacts, messages, etc to computer at will. * Supports iOS 12 & new iPhones. Why Should You Backup iPhone Data to Computer? iPhone data backup is needed for later recovery of important data files when your iPhone handset is unlucky to be damaged, stolen or wetted. Be it private photos or important contacts, you still have chance to restore these data to a new iPhone XS Max/XS/XR/X/8/7 or 6S. Speaking of switching to a new iPhone, you surely want to move all the data files from an old iPhone handset to the new one, that's why you should first backup iPhone data and restore thereafter. Besides, missing contacts, disappearing messages or lost photos after iOS update is a universal problem that annoys users every year during iOS (12) update, so iPhone data backup in advance would help a lot to get things back. Needless to say, every iPhone user would not be unfamiliar with iTunes and iCloud. When referring to backup data iPhone, iTunes is a full backup method while iCloud is a selective backup way also supporting iPhone full backup. 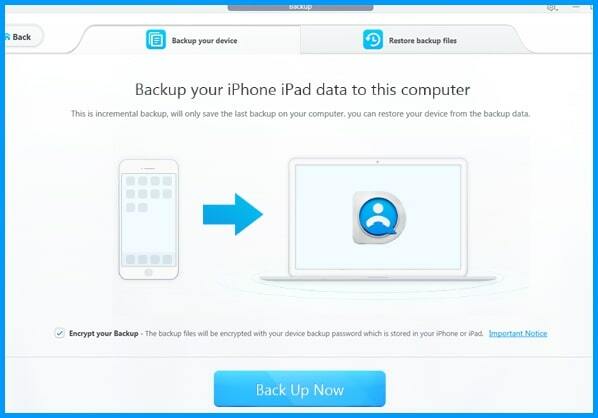 The how to backup iPhone data guide of these two methods is not hard to find out on the official site: https://support.apple.com/en-us/HT203977, but often the case is that you will only get blurry answers when iTunes and iCloud encounter problems. Now that iTunes and iCloud are not that satisfying regarding iPhone data backup, why not try a more versatile way. DearMob iPhone Manager comes here in time combining the advantages of both iTunes and iCloud. Besides iTunes full backup with encryption for iPhone, it can also selectively backup iPhone data like specific iPhone photos, certain contacts and one or more videos. Even better, it outshines iCloud and iTunes in the respect of unlimited backup space, fast speed and no data loss. How to Full Backup Data Files on iPhone XS Max/XS/XR/X etc at One Stroke? Step 1. 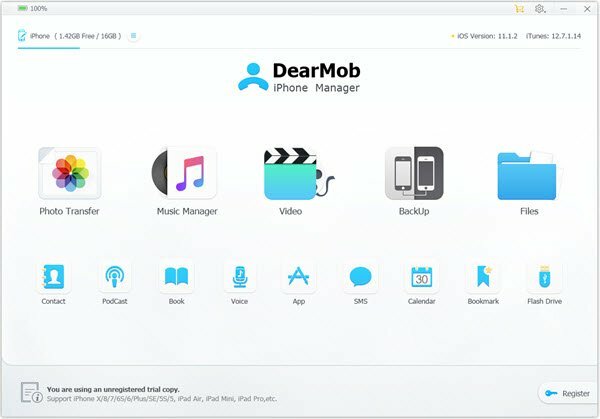 Download DearMob iPhone Manager on computer, install and launch it. Step 2. USB-connect your iPhone to computer, and tap Trust This Computer message on iPhone to manually allow DearMob iPhone Manager to read your iPhone data. Step 3. Click on Backup icon on the main UI of this iPhone backup software to access the Backup window, where you could click on Back Up Now button to start to backup iPhone data to computer in a click. Notice. By checking the "Encrypt your Backup", your iPhone data backup will be protected with a password to assure privacy safety even on a public computer. Also, 100% restore iPhone backup files after iOS (12) update or on a new iPhone is allowed by DearMob iPhone Manager. How to Selectively Backup iPhone Data to Computer? DearMob iPhone Manager is nearly compatible with almost all iPhone data including photo, music, video, Files, contact, PodCast, iTunes U, book, voice memo, ringtone, app, SMS, calendar and bookmark. You can freely choose any type of them to backup, transfer or manage. Step 1. Take iPhone photo backup as an example, go back to the main user interface of DearMob iPhone Manager and click on "Photo Transfer" icon. Step 2. Choose the photos you want to backup and click on Export on the top bar to backup them to computer. Notice. If you are using iPhone 7 or newer shipped with iOS 12/11, you may have many HEIC photos. You can convert HEIC to JPG to be viewable on Windows or Mac via DearMob iPhone Manager if necessary. Also, any private photos can be encrypted with a sophisticated password. As long as you wish, iPhone data backup software DearMob iPhone Manager can create one or more copies of the data on your iPhone iPad in case that the original data files are lost or damaged. With its help, iPhone data backup is as easy as ABC, plus iPhone file management is straightforwardly simple. No more worries about the data loss problem, you can rest assured to upgrade to iOS 12 to enjoy multiple new features or switch to new iPhone XS Max, XS and XR.